At the invitation of the Breckenridge Colorado Tourism Office, we visited this Rocky Mountain ski town in September 2015. It didn’t take much convincing. We’re big fans of hiking, fall colors, mountains, and small town history. In fact, this could be the start of an annual pilgrimage for us–a dose of fresh mountain air with some exercise, culture, and picturesque views tossed in, right in the middle of Colorado. Breckenridge has the advantage of being a real, free-standing town, established in 1859 by prospectors. 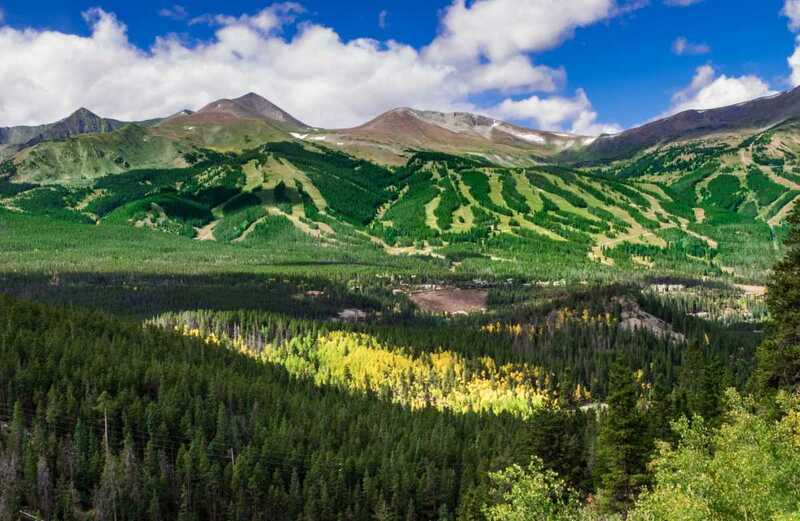 While its year-round population is only about 4,700, it is centrally located in Summit County, sort of the epicenter of Colorado’s ski territory. Breck’s population might swell to 37,000 over the winter, but whatever the season, the services and activities offered in the area exceed the small town vibe. The Tiger Dredge Trail wraps around some of the ruins of gold mining on the Swan River. Reminders of the mining era are everywhere. Most trails pass by some abandoned mine construction, and many provide detail on historic use and future plans for the land. 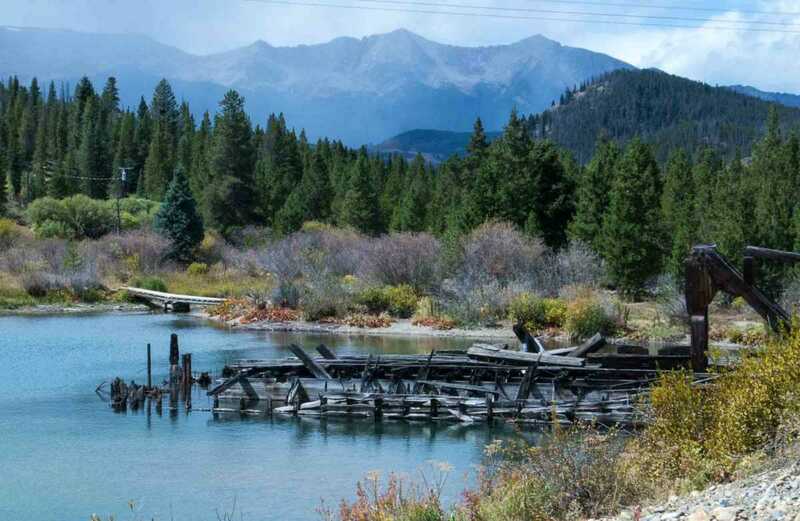 Breckenridge is still reclaiming valley lands from the slag heaps left by dredging, with an eye on future housing and reestablishment of natural river ecology. Over our four days in Breck, we somehow stayed busy and relaxed at the same time. It’s that kind of place: compact, walkable, friendly, unhurried. Buses and shuttles are free throughout the area, and the central commercial area is mixed use with shops, offices, restaurants, entertainment, and a variety of lodging options. It’s dog friendly, and full of bike paths and recreation areas. We can’t speak to the skiing, but we’re pretty fond of gazing at the green runs stretching down the mountains to the West. As for the locals, many certainly came originally to ski–and then never left. Just as many will say they enjoy late summer and autumn as much as the snowy months that attracted them in the first place. If we were to go back for a longer stay, I’m sure we’d cover some of the same walks and restaurants, but we’d also relish finding many more trails, museums, shops, and restaurants that we’ve yet to experience. Until then, here’s what we can recommend. This is the main resort of Breckenridge Ski Area, operated by Vail Resorts. Its location is perfect, set a short walk from Main Street and the Gondola base. Our lodging was a 1-bedroom condo with balcony, fireplace, fully equipped kitchen, and comfortable furniture for lounging. (Yes, we could live here indefinitely.) There’s a fitness room, pool and hot tubs, plus free shuttle service to Main Street and up to One Ski Hill Place resort. We appreciated the solid construction and the exterior space and landscaping; we didn’t feel pressed into high density housing. The property includes studio, one-, two-, and three-bedroom condominiums and two- and three-bedroom town homes with garage parking. What’s not to like? Rita’s –Fresh squeezed margaritas get things going on the right track, and there are dozens of tequilas to choose from. While you are figuring out how to write up your order, nosh on three kinds of salsa with your chips. Plenty good. Cuppa Joe –Best coffee in town, and humongous breakfast burritos. If you don’t see what you are looking for on the board, just ask. They’ll probably make it for you. Conveniently located next to Meta Yoga. Southridge Seafood Grill –A really nice menu so wonderfully presented that we dug right in without taking a single photo. We can recommend the trout and the teriyaki glazed tuna with udon noodles. Top notch place. Columbine Cafe on Main Street for your basic breakfast needs. The pancakes earned some special oohs and ahhs. 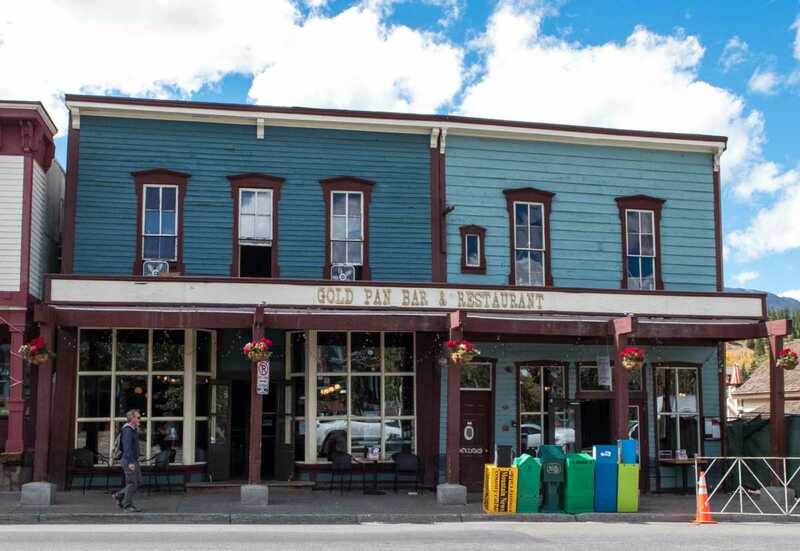 Gold Pan Bar on Main Street is the oldest bar in Breckenridge. Modis –Serving up creative cocktails. Our group enjoyed the rooftop views of Main Street during happy hour, and munched on truffled fries, buffalo sliders, and an assortment of lettuce-wrapped egg rolls. Drinks included some zesty homemade ginger beer in a bourbon mule, a Negroni, traditional Old Fashioned and Manhattan cocktails, and a classic gin and tonic. Super friendly staff, although we can say that about every place listed here. Breckenridge Distillery –This is where Breckenridge Bourbon was born, and it’s now the creative spot where Bitters, Vodka, Spiced Rum, and other surprising spirits are distilled. Our tour of the distillery by Taylor was tres educational! And tasty, of course. We only wish we’d had space to pack away some bottles. Read about our visit to the distillery here. For more spontaneous sampling, just walk into the Breckenridge Distillery Tasting Room right across from the Breck Welcome Center in the middle of town. Meta Yoga –Imagine my surprise when a dozen people showed up in the dark for the 6:30 a.m. session. Imagine my surprise when several asked for an earlier start! But our instructor played it just right, moving us through gentle stretches and twists. I acknowledged my mat and myself for showing up. A pedal-assist bike is the way to go–and return. Parked here on a bridge over the reclaimed Blue River north of Breckenridge. Electric Biking –I was afraid to admit I rented an electric ‘pedal-assist’ bike, but a lot of the cool kids assured me it’s the way to get around the area, especially if you are going up the mountain and into the wind. And you are old (guilty). Or drunk (not guilty). I pedaled for a couple hours, and loved that I could detour up some dirt roads to scenic overlooks and nearly all the way down to Frisco, without worrying about getting back home. 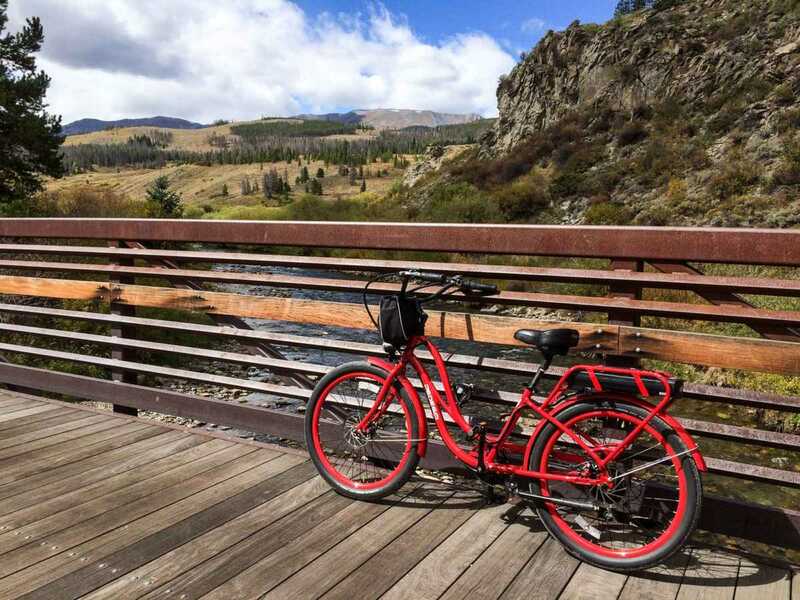 This is a great way to enjoy Breck’s recreational path and tour the Rec Center, outdoor fields and courts, and check out developments along the Blue River. The Craniologie shop (which concentrates on selling helmets and goggles and head accessories in the winter) took good care giving instructions with the rental. It was a breeze! Hiking –Oh yes, there’s plenty of hiking. I really do want to return to try more trails. For now, you can follow me along the McCullough Gulch hike, which is described here. Golf –We had a notion to play a round, and we did visit the 27-hole Jack Nicklaus designed course, owned by the city. But given a little snafu in our tee time, we decided not to impose on the serious looking dude who we were about to be paired with. I mean, who wants to show up one of the regulars? We bowed out quietly, and tried not to touch anything in the Pro Shop. 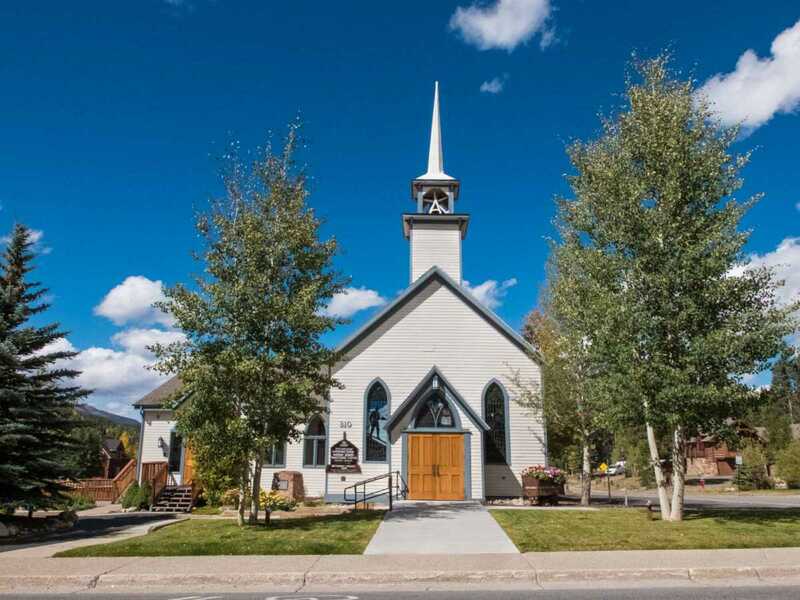 Father Dyer Church in Breckenridge, founded by the itinerant preacher who covered the area on skis. Heritage Alliance Tour –Take a classy and worthwhile stroll through town with someone who can tell you about the wild west characters that built this place in the midst of the gold rush. Most of the stories seem to involve ladies of the night, jealous husbands, and greedy shopkeepers. There are some 250 historic buildings still standing in Breckenridge, and quite a few spots where duels were fought and goods were stolen. Everybody has to make a living. Our guide, Alison, also filled in a little personal history: her parents met on the ski lift in 1975, and never left. The Alliance conducts tours of gold mining and panning sites, and leads periodic Paranormal Investigations to the spookier parts of town. Several museums and homes are also open to the public. Get the info or join a tour at the Welcome Center. Cooking Class –Whether you are passing through or living in Breckenridge, one of the town’s handy resource centers is Colorado Mountain College. Its degree programs in everything from culinary arts to environment to emergency medical and fire science must certainly impact the area as a whole. But for fun and edification, visitors can sign up for a cooking class with Chef Ian Ruxton. He creates the fastest pace, highest energy cooking session we’ve ever attended by setting everyone up with a station, all the ingredients, and just the right amount of supervision. Of course eating is next, followed by waddling off with your packet of recipes. Just check out the Continuing Education class schedules. Luckily (by design) our visit coincided with the annual Breckenridge Film Festival, and the special 35th anniversary of the event. We saw the opening night film, Snowman, and got a peek into another side of the local scene: the people who’ve been promoting film, arts, and civic events over the years. This ‘little’ film festival screened some 70 films over 4 days, including shorts, animation, drama, documentaries, kids’ flicks, you name it. The scope is impressive for a town this size, and demonstrates the energy of the whole Summit County area. There are lots of other arts festivals and epic annual events. Follow BreckCreate to get a glimpse of the arts efforts that permeate the Breckenridge scene. 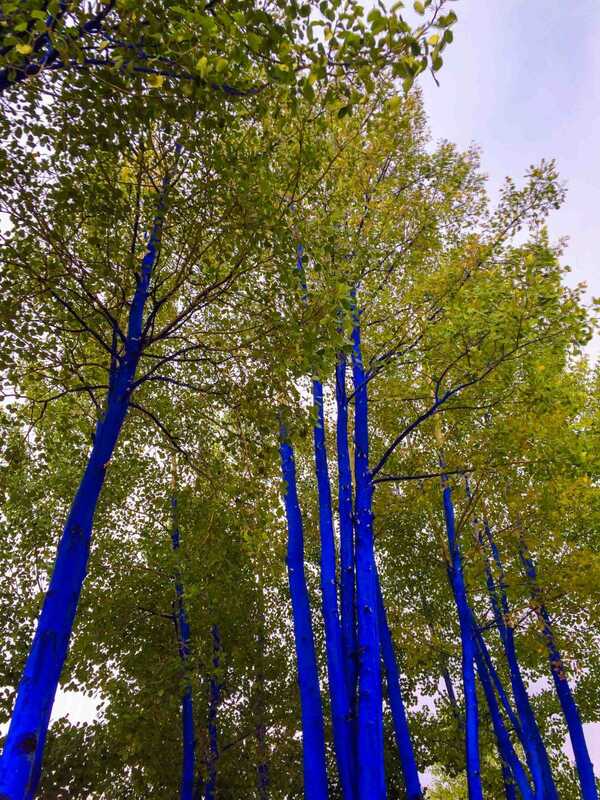 Art and nature are one in Breckenridge, in and around the Blue River. See our other coverage of our visit to Breckenridge, here, here, and here. I love the feel of a small town in fall. It’s beautiful. Thanks, Corinne, and you are absolutely right. I’m beginning to think small towns–or at least those as dynamic as this one–are attractive pretty much all year ’round. Love how you’ve compacted so much info into one lovely post. Thanks for the recommendations on where to stay, where to eat, and what to do. Sounds like a great vacay. Rusha, we oughta compare notes between Breck and Albuqueque. Breck! We haven’t visited in a few years, but always enjoy time there. One of our favorite non-winter activities is grabbing a picnic lunch and hiking in the mountains to enjoy the mountains. Thanks for sharing! You got that right, Rob. It’s a hiker’s (and nature-lover’s) paradise. I want that RED BIKE!. Breckenridge is awesome for skiiing too! Great post. Thanks for sharing! haha, I do, too! I decided if I move to Breck I’d want to have three bikes: this one, a mountain bike, and a road bike. That’s not asking too much, is it? 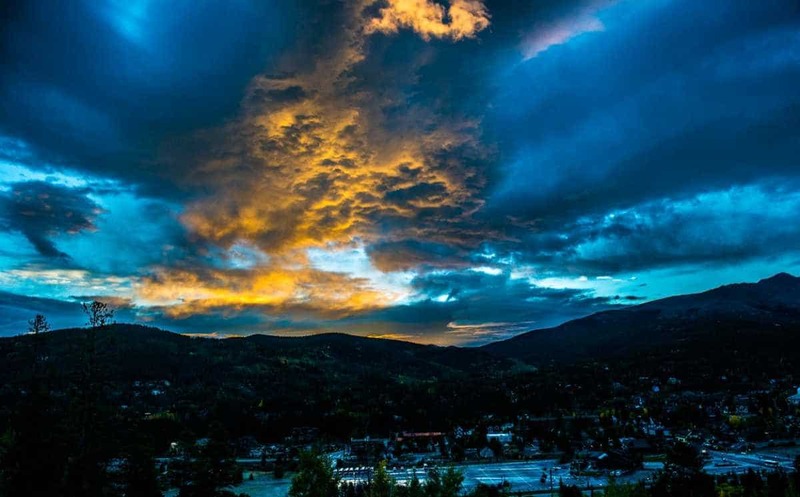 We know several people who have stayed in Breck for an extended period and they love it. Looks like you managed to have a full experience in your short stay. E-biking is the greatest invention since sliced bread in our opinion. Fun read. Thanks, Betsy. I’ll look at more of your E. Europe posts before we head that way in a week. My husband Bill’s daughter owns a 2BR cabin in Breck and we have stayed there once. I remember the lovely stream that one can trace from up where the cabin was and the evergreens galore to downtown where a multitude of flowers brighten up the scene. And the yellow biking jacket I got from a shop there is a prized possession still! oooh, if there’s a place available to you via family, I hope you can seize it on a regular basis! Now I’m wondering if I can convince Tom a bike tour in Europe is possible after all. Our primary gauge is, “Do we feel healthy when we are here?” There’s something about the altitude and fresh air that makes us eat well and stay active. I was in Breckenridge probably close to 20 years ago (which seems impossible) to go skiing with a former BF. I loved it even though I just took skiing lessons every day and didn’t progress much. I think I’d prefer it in the autumn when you went. Less frightening and those electric bikes are very appealing. But yoga at 6:30 a.m? Only if it’s the only way to save my life! I have a feeling Breckenridge has changed quite a bit in the past 20 years. The old boyfriend probably has, too. You and I are ready to go, any season! Mr. E and I spent one night at a B&B in Breckenridge on our drive from Denver to Aspen for some lung doctor thing. What we learned from the experience was 1) yes, there is beautiful scenery, and 2) do not share a bottle of red wine at over 10,000 feet when you start the day at sea level. That is all. It’s high alright. If Quito taught me anything, it was to drink lots of water with my wine. Very informative posts! Brings back fond memories of my time spent in Colorado, although I was most commonly in Breck during the ski season. It truly is a four-season town though and glad you were able to experience it during the mild Fall weather. We asked a lot of residents which season was their favorite, and inevitably the response was…long and complicated. Thanks. Kristin, I just found your wonderful article about my little ski town! You’ve captured it perfectly and we’re just about to see another season of fall foliage in the coming days. After 22 years here I never tire of the changing of the seasons, one to the next. Thanks for the great story! Thanks! That’s great to hear from someone who knows and loves the place.